WyKevin, mom - Mrs. Bazemore, and Kent. "He inspires me...He's playing the best basketball he's ever played. He's taught me how to persevere." When asked about his brother, WyKevin, Kent Bazemore smiles and looks off, praising his brother's tenacity. Kent credits WyKevin for being a large part of his support system, helping him get through the highs and lows that can come with an NBA season. Log onto twitter.com and you'll find one of the biggest Kent Bazemore fans there is. The only difference with this fan is he grew up with the Atlanta Hawks' young starting guard/small forward. WyKevin is four years younger than Kent (making him 22 years old), he said he and his brother would play basketball and football in the backyard growing up. "My mom played basketball, my dad played basketball and two of my uncles were really good at basketball...so that's how [Kent and I chose to play]." Having an older brother in the NBA has many benefits, especially when you play the sport yourself and pursue playing it professionally. When WyKevin visited Kent during the holiday season, he was able to work out with him, and Kent told him the ins and outs of the sport, showed him a couple of moves, and WyKevin was even able to check out how Al Horford and Thabo Sefolosha put in work in the gym. "That's one thing I did when my brother was with Golden State, too, just watched the players work out. I learned a lot from just watching the players." WyKevin, a 2015 graduate of Winston-Salem State University, has been creating quite the reputation for himself. He was named the Global MVP of the EBA league - 2015 Leon, led Winston-Salem in rebounds for (three) straight seasons, ranked second in the CIAA in rebounding from 2012-13, was named to the All-CIAA team for two straight seasons, was the 2011-12 leading rebounder in the CIAA, was the 2012 CIAA rookie of the year, was named the conference player of the year, and was the North Carolina Coaches Association's East-West All-Star Games pick in high school, just to name a few accolades. Playing in an international league presents some obstacles, such as a language barrier (WyKevin doesn't speak Spanish) and the distance from loved ones and familiarity. Distance doesn't impede the Baze brothers from critiquing each other's games, however. WyKevin readily admits, ”We both watch each other's games, criticize each other a lot. We're basically each other's biggest critics. He'll let me know what I'm doing right and what I'm doing wrong." Kent knows that his brother’s hard work is paying off, “He’ll send me highlights. His team will tweet out stuff, keep me posted. He’s playing…[Kent rattles off WyKevin’s stats] it’s crazy numbers. I don’t care where you’re playing at, that’s impressive. And I’m so proud. That’s my guy.“ WyKevin currently leads the EBA averaging 23.4 points-per-game. WyKevin openly praises, and constructively criticizes, his brother's performance on the court using social media. While it's sometimes expected and encouraged to be critiqued by family, the fans can be a little harsh. Kent needs no updates on what those watching him have to say, he sometimes sees it on his own. WyKevin advises him to channel the negativity he sees and use it as motivation to "play better." The #BazeBros are always looking out for one another. Whether it's at a game or on Twitter or Snapchat, Kent doesn't have to look far to find the positive reinforcement he might sometimes need. He has it right where he's always had it, with his family. 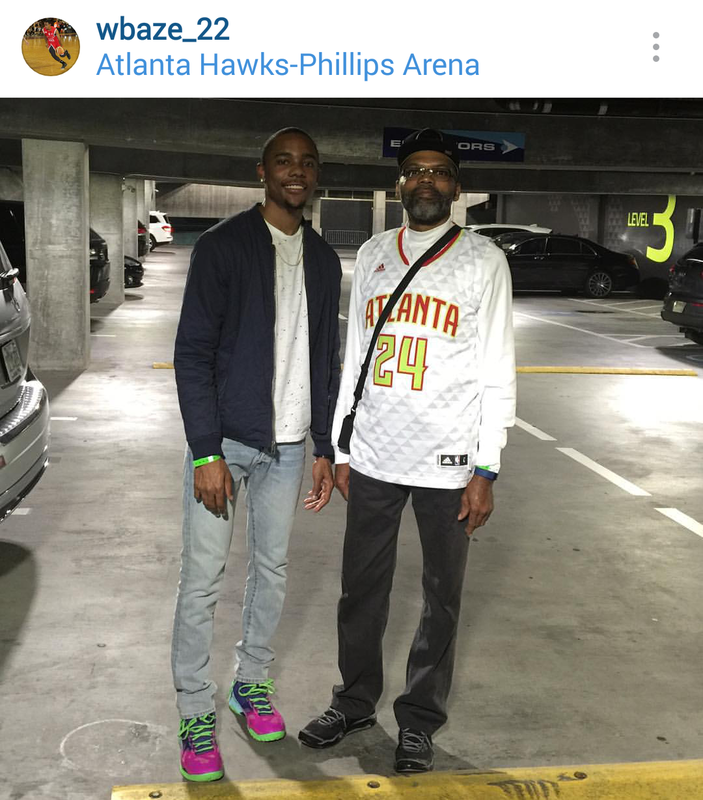 Wykevin and dad, Mr. Bazemore, after the Atlanta Hawks game.